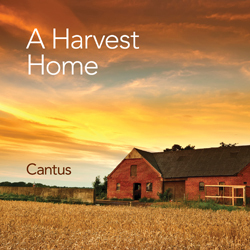 Cantus recordings are available as CDs and most are also available as downloads (iTunes or mp3). 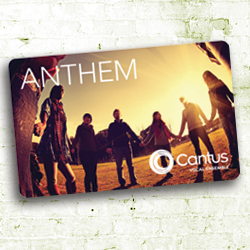 The latest recording, Anthem, is only available as a download card. If you encounter any difficulties while ordering or wish to order by phone, please call 612.435.0055. This EP recording, Anthem, features six new tracks from Cantus recorded live in concert, exhibiting the energy and excitement that a live performance creates! With everything from A. R. Rahman’s Bollywood-infused “Wedding Qawwali” to a Balinese monkey chant, Anthem explores how various cultures join together in song. Available exclusively in a download card format. 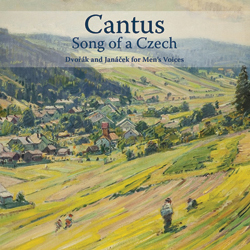 In this new recording of repertoire by two giants of Czech musical history, Cantus explores fascinating treasures of the choral canon, rarely heard outside of eastern Europe. Including repertoire that spans nearly a thousand years from “Sederunt”—one of the first known works of polyphony—to U2’s “MLK,” along with works by Sibelius, Mendelssohn, Schubert and Randall Thompson. The original cast recording of the story of the camaraderie, peace and music in the middle of a horrible war. An outstanding contribution to the library of classical male choral repertoire, the album celebrates life through a gorgeous marriage of poetry and music. New and contemporary works from Steven Sametz, Edie Hill, Maura Bosch, Eric Whitacre and Veljo Tormis. 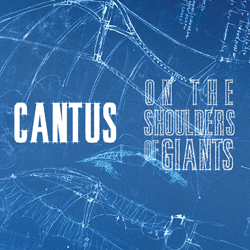 The eponymous recording from Cantus is the definitive disc to own, programmed to reflect a typical Cantus concert. Includes “Last Letter Home” by Lee Hoiby, sacred music from Russia and America and popular music from Billy Joel and Smokey Robinson. A compilation of songs based on a man’s travel across the sea, “Home” reflects all of the emotions of the journey. Cantus presents live tracks from recent concerts including collaborations with the St. Olaf Choir, guest conductors Dale Warland and Anton Armstrong and the 20 member Cantus 10th Anniversary alumni choir. A lively compilation, Volume Two highlights the diversity of Christmas and focuses on holiday music from around the world. Cantus has assembled a treasury of the most beloved African-American spirituals, including well-known and long-forgotten arrangements of these cherished songs. Virtuoso works for male choir by Carl Orff, Jean Sibelius, Samuel Barber, Josquin des Pres and Claude Debussy. Cantus creates an eclectic mix of music from all over the world.